Forget the Caribbean and cancel those New York flights. ISIS-controlled territories are more desirable, having all the qualities of a “plush holiday resort,” claims a new jihadist e-book designed to lure people into the land of war crimes and atrocities. The guide – which paints a lovely picture of the Islamic State (IS, formerly ISIS/ISIL) 'caliphate' – was written by Abu Rumaysah al-Britani, a British jihadist who skipped bail in the UK and claims to have fled to fight alongside IS in Syria. The 46-page document is broken down like any typical tourist guide – with sections for weather, transport, technology, people, and education. Promoting the region's Mediterranean climate, the e-book compares the area to a “plush holiday resort,” adding that it is geographically diverse and provides stunning scenery. The great weather is joined with diverse people, according to the guide, providing a more cosmopolitan setting than New York or London. The guide also taps into the local cuisine, reassuring readers that their favorite sweets – including Kit Kats, Twix, and Snickers – will still be available to them. For those looking for more savory dishes, the e-book promises sheesh kebabs and falafel sandwiches. Britani boasts of the education offered in the territories, vowing that young minds will not be corrupted by non-Muslim content such as music and evolution. However, the guide conveniently fails to mention that such education is aimed at males, as females are expected to adopt domestic roles and are not given the chance to gain an education or work. As for transportation, IS has some ambitious plans, stating that the future could easily hold the possibility of zeppelins, hovercrafts and microlights. But at the very end of the guide, Britani manages to reveal the terror group's true colors. In the final paragraph, he concludes that IS will descend on the streets of Washington, Paris and London, converting residents to Islam and demolishing everything in its path. Britani, a father of four from London, was one of nine mean detained in September on suspicion of encouraging terrorism and supporting the banned militant group Al-Muhajiroun. He was released on bail and ordered to hand in his passport. However, less than 24 hours after being set free, he took a bus from London to Paris and headed to the IS warzone with his family. 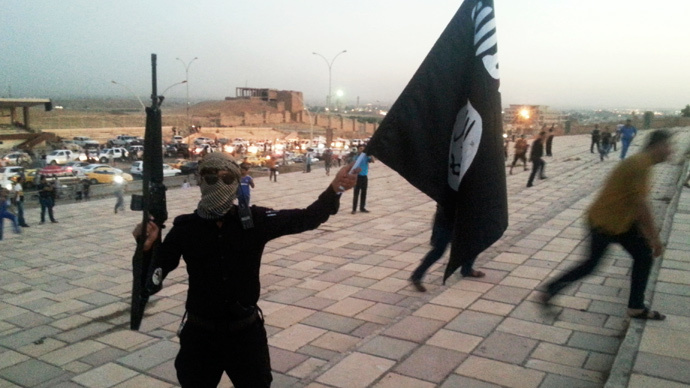 IS has previously drafted a guide aimed at helping people move to the territories. In February, the group released a 50-page e-book offering would-be jihadists advice on how to reach Syria to join the group.